The Blob could be back. Or, maybe it’s the Son of Blob. 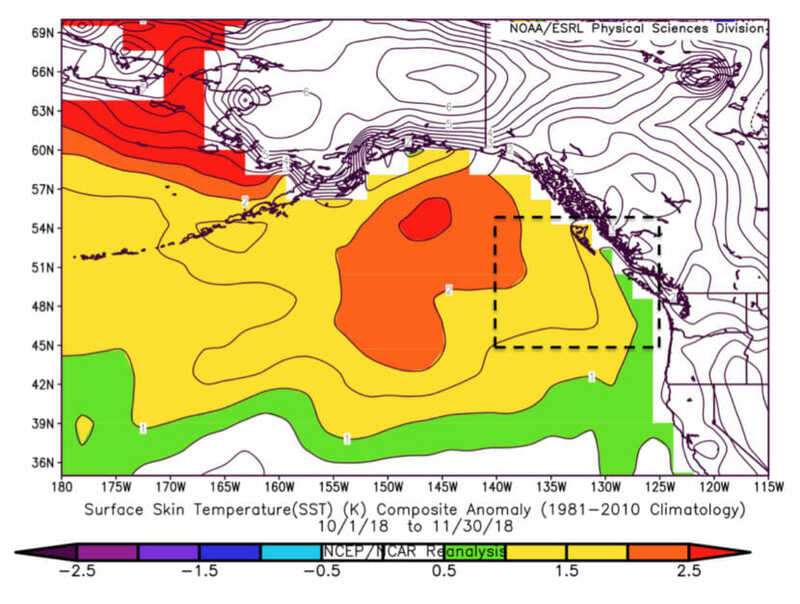 Either way, the warm water phenomenon first discovered in the North Pacific five years ago is slowly reemerging in the Gulf of Alaska. Although it doesn’t appear to be as strong as the original, it could still affect weather and fisheries in Southeast Alaska. Nick Bond is the Washington state climatologist who coined the name “the Blob” when he discovered the original patch of warm water emerging in late 2013. Bond said Gulf of Alaska weather was unusually quiet this past summer. “Without winds to draw heat out of the ocean and to mix up colder water from below, the near-surface waters, again, got quite a bit warmer than normal,” Bond said. Currently, the water in the Gulf is about four degrees Fahrenheit warmer than normal. That isn’t as hot or doesn’t extend quite as deep as the original Blob. At least not yet. Rick Thoman, a Fairbanks-based climatologist with the Alaska Center for Climate Assessment and Policy at University of Alaska Fairbanks, expects these Blob-like conditions, in combination with the current El Niño event in the Pacific, will shift the jet stream and North Pacific storm track to the east. That could mean mild conditions, less freezing and more rain instead of snow, especially in Southeast Alaska, which Thoman said is “much more sensitive” to ocean changes. “So, we can go wrong by a lot more for Southeast in these situations than, say, the western Gulf of Alaska,” Thoman said. Southeast Alaska is already experiencing warmer-than-normal conditions again. November was five degrees above normal in Juneau, according to the National Weather Service. Unusually warm ocean conditions likely caused previous shifts in pollock spawn timingand extended the range of salmon into Northwest Alaska. What could this mean for the children and grandchildren of the original Blob salmon in Southeast Alaska? “I think, at this point, I would just say it’s largely uncertain what effect this is going to have,” said Andy Piston, Southeast Alaska pink and chum salmon project leader with the Alaska Department of Fish and Game. Piston said they’re already forecasting a weak run of only 18 million pink salmon returning to Southeast Alaska next season. Piston said warmer water usually means less fatty zooplankton, a common food source for juvenile salmon. Fewer calories means slower metabolism, slower growth, and reduced chances of surviving at sea. Even if they do survive out on the open ocean, salmon may return smaller and lighter. But Piston said the original Blob did not have a uniform effect on pink salmon runs. Pink salmon made up only 12 percent of the value of Alaska’s total catch in 2018, even though they were 36 percent of the volume. In Southeast Alaska, pink salmon are the bread and butter of the seine fleet, with a two-year moving average of $112 million dollars for fishermen at the docks. Previous articleWhat happens when an oil producer moves into the neighborhood?